A research collaboration between A*STAR's Genome Institute of Singapore (GIS) and Institute of Molecular and Cellular Biology (IMCB), and the Stanford University School of Medicine, has discovered methods to efficiently generate pure liver cells from human stem cells. This could lead to more effective ways of treating liver failure. The team, led by Dr. Ang Lay Teng and Dr. Bing Lim from GIS, Professor Kyle Loh and Professor Irving Weissman from the Stanford University School of Medicine, and Dr. Chen Qingfeng from IMCB, also successfully grafted the generated liver cells into mouse models which improved their short-term survival rate. Liver disease has few treatments and imposes a substantial healthcare and economic burden1. Currently, end-stage liver failure can only be treated by liver transplants. Due to the scarce supply of liver donations, more than one million patients worldwide die every year while waiting for transplants. To address this problem, the researchers aim to artificially generate large numbers of liver cells from human embryonic stem cells. "Embryonic stem cells have the potential to turn into thousands of cell-types in the human body. The key is to understand how to turn them solely into liver cells. Generating these highly-pure liver cells from embryonic stem cells is an important step towards using these cells for cell transplantation," said Dr. Ang Lay Teng, Senior Research Fellow at GIS. She explained, "The process of generating highly-pure liver cells involves a series of steps. As the whole process of liver development is not fully clear, one major challenge we faced was how to precisely control the development of stem cells into liver cells." "With almost unlimited development potential, embryonic stem cells can be made to develop into any other cell. The stem cell's development is similar to a complex train map. In this case, the generation of liver cells would be our destination. The crux of our research is to identify the six requisite stops and map the path needed for a stem cell to develop into a liver cell," added Professor Kyle Loh, Assistant Professor at the Stanford University School of Medicine. Dr. Ang continued, "Another major challenge was the difficulty in obtaining liver cells which were derived from human embryonic stem cells. 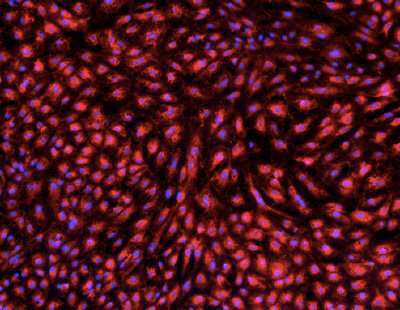 These cells also needed to be capable of regenerating real liver tissue in animal models. However, our stem cell-derived liver cells were able to be successfully grafted into mouse models with liver injuries. This process improved their short-term survival remarkably. With progress, there is potential to eventually treat patients with liver failure in the future." Dr. Ng Huck Hui, Executive Director of GIS, said, "The ability to generate large quantities of stem-cell derived liver cells holds the potential to sustain patients with liver failure while they await a full liver transplant. This holds great promise for helping to improve patient survival rates and alleviate the burden of liver failure on societies." The research results were published in Cell Reports on 20 February 2018.